Kiss goodbye to dull, flaky chapped lips with the ultra-nourishing lip care products from Juicy Chemistry. Nourishing shea butter, rich Avocado oil and soothing essential oils gently address the dryness and help seal in the moisture. The lip butters works well for dry, chapped lips, leaving it smooth and also they penetrate deep into the skin cells to rejuvenate your lips.This classic combo of chocolate and mint will please the chocoholic in you and keep your lips hydrated all day long! * Our no-nasty promise: All our products are 100% natural and chemical-free. We will never stick parabens, preservatives, petroleum products, artificial perfumes, alcohol, etc in them. * We never test our products on animals. Coming to the packaging of Juicy Chemistry Choco Mint Lip Butter, I feel there is room for improvement. It comes in a twist-up packaging, but the brand and product details are wrapped in paper which is torn and worn with daily use, as you can see in the images. I wish they do something about this. 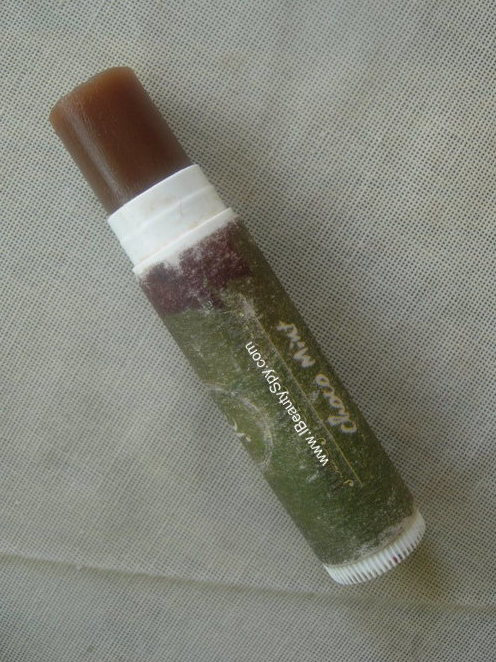 Juicy Chemistry Choco Mint Lip Butter is chocolate brown in color and has a thick butter like texture. The scent is more minty than chocolatey. Juicy Chemistry Choco Mint Lip Butter adds a subtle shine to the lips due to the presence of oils. But it will fade away in a while making lips look natural. I like to apply a tinted lip balm on top of it. Am currently using the organic lip tint from Island Kiss. Coming to the scent, I was kinda disappointed since I had expected a chocolatey scent. That was the primary reason I bought this lip butter. But the minty scent is more prominent. The fresh minty scent lingers for a long time actually, until you drink or eat something. Juicy Chemistry Choco Mint Lip Butter is a non-tinted, good, daily use lip butter to prevent dry and chapped lips and keep the lips in good condition. But if you already have chapped lips, this doesn’t do much to repair them. So while it can prevent chapped lips with daily use, I feel it cannot heal already chapped lips. The ingredients list is simply great. Avocado oil as we all know is an excellent moisturizer as its full of essential fatty acids. Along with sweet almond oil, vitamin E, shea butter and cocoa powder, this is one of the best 100% natural lip balms in the market. Yes, partially. I didn’t find any effect on healing chapped lips though. Its not nourishing enough for that. * 100% natural, organic ingredients and free from chemicals. * No parabens, preservatives, petroleum products, artificial perfumes, alcohol. * Thick butter like texture which moisturizes and nourishes lips. * Lasts for around 3-4 hours and survives small drinks and water. * Doesn’t add extra shine or gloss to lips. * Fresh minty scent which lasts for a long time. * Good for dry lips as daily use. Prevents chapped lips and keeps the lips nourished and healthy. Not deep nourishing to heal chapped lips. Its pricey for a lip balm. But considering its made up of 100% natural, organic ingredients, I think its worth it. 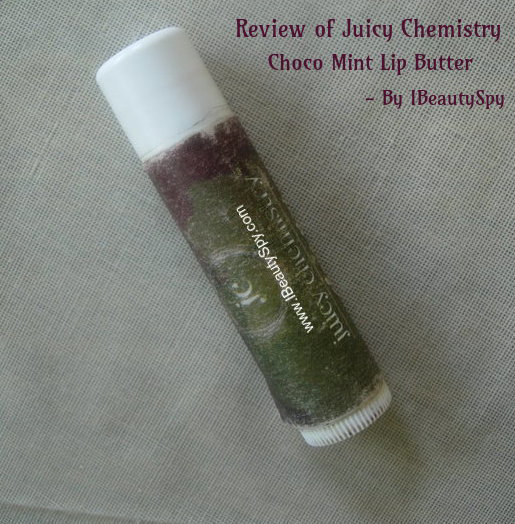 Overall, Juicy Chemistry Choco Mint Lip Butter is a good, daily wear lip balm for dry lips. I like the fact that it is made up of 100% natural ingredients. I only wish that it was more deep nourishing, containing shea butter in more proportion, to heal chapped and cracked lips also. Then it would be the perfect lip balm for me! But, still, I would recommend you to try this atleast once and feel the naturalness (forgive me for the word! 🙈) on your lips, after using all our drugstore lip balms over the years! JC has hiked the prices a lot! These were available for Rs. 150 earlier!